Four iconic novels of adventure, science, and fantasy from a master storyteller far ahead of his time. In Twenty Thousand Leagues Under the Sea, a monster wreaks havoc in the waters of the Atlantic Ocean. The US government sends a French marine biologist, his servant, and a Canadian harpoonist to take care of the problem. But instead of a mythic beast, the team finds the submarine Nautilus and its fearsome helmsman, Captain Nemo. 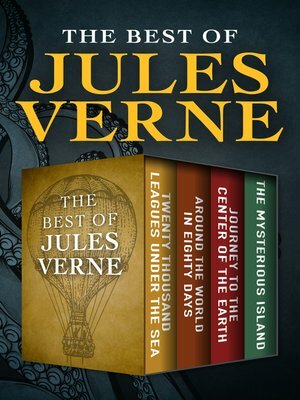 Around the World in Eighty Days follows Phileas Fogg and his eccentric manservant, Passepartout, on an epic quest to circumnavigate the globe. Pursued by a Scotland Yard detective, derailed by a herd of bison, and attacked by Sioux Indians, the travelers use every mode of transportation possible to race from one exotic exploit to the next. From the sands of Egypt to the icy waters of the Pacific, Fogg and Passepartout never lose sight of their goal—even when they stop to rescue a beautiful damsel in distress. Journey to the Center of the Earth is a cornerstone of science fiction and one of the greatest stories ever told. A dirty slip of parchment paper falls from the pages of an ancient manuscript. Deciphered by the indefatigable Otto Liedenbrock, professor of geology, and his reluctant nephew, Axel, the parchment's coded message asserts that a volcano in Iceland contains a passageway to the center of the earth. Two days later, the adventurers embark on a journey so fantastic it will alter the very meaning of history. In The Mysterious Island, a hot air balloon hijacked by captured Union army soldiers is blown far, far away from its point of departure in Richmond, Virginia. When the craft crash-lands on an island in the South Pacific, the prisoners must contend with wild animals, pirates, and an active volcano—in a fight for their very survival.